Steadily lowering fees are making LTC more efficient as a medium of exchange. Faster transaction times have made LTC more efficient as a medium of exchange. The potential for private transactions gives LTC the potential to fill a new use case. An anticipated decrease in the growth of new LTCs being created has the market valuing existing litecoins more. These factors allude to a broader insight about how Litecoin distinguishes itself from Bitcoin and some other crypto projects. Despite being a decentralized network, Litecoin as a project has clear leadership, headed by Charlie Lee and the Litecoin Foundation. It appears as if that leadership may be making it easier for Litecoin to forge ahead with new upgrades and community outreach, in contrast to cryptocurrencies with consensus mechanisms yet no apparent captain at the helm. The fundamental determinant of whether something can function as a medium of exchange is whether or not people, merchants, and institutions actually accept it as such. Remember that, in the first known exchange of BTC for a good, Laszlo Hanyecz purchased two Domino’s pizzas for 10,000 BTC. Those bitcoins were worth $41 USD at the time; today, they’re valued at $40,256,250 USD. As tragic as that transaction might look given the current price of BTC, it was a momentous occasion precisely because it definitively showed that Bitcoin could function as a medium of exchange. Simply put, the more parties that accept a cryptocurrency such as Litecoin, the more value it may have. And Litecoin adoption appears to be steadily growing. LTC’s partnership with Spend, announced on February 13th, increased the number of locations LTC can be spent by 40 million locations. Where it was once a Herculean effort to get a pizza with BTC, now you can buy a Subaru off some lots with LTC. Although some sites, such as uselitecoin.info, attempt to keep records of merchants that accept Litecoin, there’s unfortunately no singular transparent data source to track the rate of LTC adoption by merchants worldwide. Responding to a request for such data, the Litecoin Foundation told SFOX that LTC is accepted by “tens of thousands [of] merchants worldwide and growing.” So, while it’s challenging to corroborate LTC’s adoption rates with hard data, it may be that the market is reacting to at least the perception of increased LTC adoption. One of the original motivations for peer-to-peer digital cash like Bitcoin and Litecoin was the desire to reduce transaction fees. Transferring money via Western Union can incur fees upwards of 10%; Visa fees can incur fees of multiple percentage points for merchants. Median Litecoin transaction fee over the last year. In one year, median LTC fees have dropped almost 65%, from $0.0385 USD to $0.0136 USD. 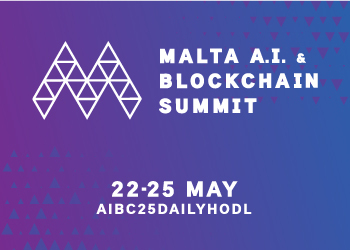 Source: BitInfoCharts. As Litecoin’s transaction fees decrease, it becomes more valuable as a medium of exchange, which can potentially lead to increases in LTC’s price. Litecoin has been in the spotlight for a while for its low fees, which have been proving stably low for even the largest transactions. Back in November, for instance, it made headlines for a $62 million USD transaction processed on Litecoin for a $0.50 fee. We saw this factor rear its head in February 2019 amidst expectations of Litecoin Core 0.17.1’s release, the beta of which just launched on March 9, 2019. This release was expected to reduce Litecoin’s transaction fees by 10x, so news that the release was imminent may have contributed to the climb in its price. Beyond transaction fees, transaction speed is the name of the game when it comes to the utility of digital cash. The ultimate test of this is point-of-sale transactions. Consumers have an expectation of being able to buy goods in a matter of seconds, whether that’s through handing a cashier physical cash or using a credit card. One of crypto’s collective pain points in the past couple of years has been slow confirmation times. Even Litecoin, one of the faster-growing blockchains, only has blocks added about every 2.5 minutes . Iif you need to wait for your transaction to be added to the blockchain before your payment can be considered validated, your shopping experience will be much slower than it is with cash or a credit card. Litecoin’s block confirmation times have ranged from 2.175 minutes to 3.09 minutes. Source: BitInfoCharts. Recently, however, Litecoin has been focusing on getting speedier – with a little help from Lightning Network. Lightning Network is a layer-2 solution: protocols that sit “on top” of blockchains and interact with them without changing anything about the blockchain itself. Lightning Network aims to make blockchain transactions faster, confirming them within a matter of seconds or milliseconds, while only using the blockchain to settle these transactions on a slower basis. Lightning Network has actually been around since its beta release for Bitcoin and Litecoin last March. It’s only recently, however, that it’s started to gain some real traction. And, as has been the case for other new features, Litecoin seems to be the proving ground for Lightning Network – before Bitcoin fully embraces it. 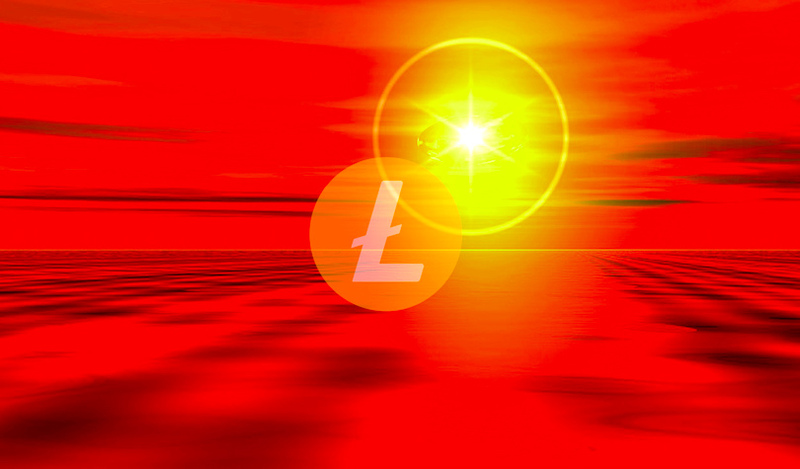 Since the start of 2019, Litecoin has passed the milestones of running over 100 active Lightning Network nodes and over 1,100 Lightning Network payment channels. More to the point, as of February 9th, over 4,500 merchants accept Litecoin Lightning Network payments, further fueling adoption. It’s not clear that the increase in Litecoin’s Lightning Network nodes contributed directly to its most recent price increase. The causation could just as easily have gone the other way, with Litecoin Lightning Network transactions increasing as a result of the price increase. All else being equal, though, increased transaction speed for a medium of exchange such as Litecoin increases its utility. Back in October 2018, Litecoin creator Charlie Lee told SFOX in an interview that he believed more privacy and fungibility were necessary for both Litecoin and Bitcoin transactions. Perhaps it should not have been surprising, then, when it was announced on February 7th, 2019 that the Litecoin Foundation is exploring using the Mimblewimble protocol to add confidential transactions to the Litecoin network. Whether or not the market was surprised, it certainly seemed to react to the news. While the whole crypto market spiked in volatility between February 7th and February 8th, LTC (represented in green on the below graph) jumped far more than the rest of the market did. Data on the 30-day historical volatility of the crypto market, gold, and the S&P 500. Source: The SFOX Crypto Volatility Report: February 2019. As Lee noted in the above quote, it’s not totally clear that privacy for a cryptocurrency is a net positive. It may, for instance, create new roadblocks for its adoption and support in a rapidly maturing ecosystem. However, insofar as people are interested in making private transactions, adding privacy as an optional feature for Litecoin transactions does add to Litecoin’s utility. And whether or not privacy ends up being a positive thing for Litecoin in the long run, its spike in volatility following the Mimblewimble news strongly suggests that the issue of privacy matters to the market. We can’t forget about the fundamental law of supply and demand. When there’s a decrease in the supply of an asset, all else being equal, theory tells us that its price will increase. One way in which the rate of supply periodically decreases for cryptocurrencies such as Bitcoin and Litecoin is through what’s called a halving event. Every 840,000 blocks, the number of new LTC brought into circulation by each new block added to the blockchain is cut in half, until the total number of LTC to ever exist – 84,000,000 – are released. Halving events thereby reduce the rate at which new LTC are added to the supply – and, historically, the market has priced that decreased growth into LTC ahead of time. 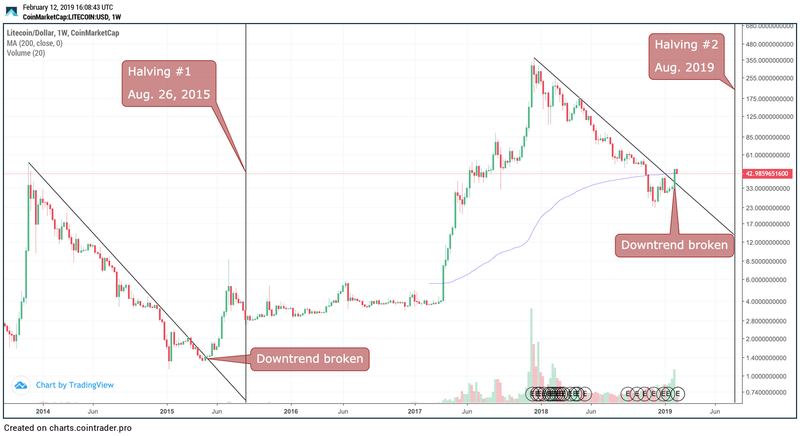 A graph showing broken downtrends in LTC’s price ahead of its first halving event back in August 2015, and ahead of its second halving event in August of this year. Source: CoinDesk. While halving events are relatively infrequent and don’t attract much attention in daily price discussions, they’re worth keeping track of since they have such a stark impact on coin supply. You can track the times and stats related to Litecoin’s halving events at LitecoinBlockHalf.com. The dramatic climb in LTC’s price naturally invites the question: Is LTC’s current price appropriate for its underlying value? That’s not an easy question to answer. Because cryptoassets constitute a new asset class, there isn’t anything like a standardized valuation framework for them yet. When we analyzed the Ethereum price drop last year, we experimented with back-of-the-envelope valuations of ETH using DCF (discounted cash flow) analysis. That was possible because, since Ethereum basically functions as a big computer, we could analyze the inputs and outputs to that computer as a proxy for “cash flows” of some sort. But Litecoin is “cash” for purposes of this analysis, so trying to set up a valuation in terms of its “cash flows” is a category mistake. In this equation, M = the size of the asset base (the cryptoasset’s market cap); V = the asset’s velocity (the rate at which the assets in circulation change hands); P = the price of the resource being provisioned by the cryptonetwork (the average transaction value on the network); and Q = the quantity of the asset being provisioned by the cryptonetwork. To determine a valuation for an asset like LTC, we first calculate P and Q, then make an assumption about its velocity, and finally use these values to calculate a projected market cap, from which we can arrive at a price per coin. The velocity of LTC is hard to calculate precisely since it’s difficult to tell how many coins are actually in circulation, rather than being stored or simply having been lost. However, we can stipulate and run calculations with a few different values for V, based on some assumptions about the range of velocities for LTC. As James Kilroe discusses, the velocity of M1 money – the most liquid (i.e. easily convertible to cash) assets – is usually between 4 and 15. On the assumption that Litecoin is comparable to M1 money, we can explore the range of its valuations by setting V to three different values within this range: 4, 10, and 15. If V = 15, then M = $82,258,898,790 USD / 15 = $5,483,926,586 market cap. The price of 1 LTC = $5,483,926,586 market cap / 60,900,996 LTC = $90.05 USD/LTC. If V = 10, then M = $82,258,898,790 USD / 10 = $8,225,889,879 market cap. The price of 1 LTC = 8,225,889,879 market cap / 60,900,996 LTC = $135.07 USD/LTC. If V = 4, then M = $82,258,898,790 USD / 4 = $20,564,724,700 market cap. The price of 1 LTC = $20,564,724,700 market cap / 60,900,996 LTC = $337.67 USD/LTC. What, then, does this model imply about the current price of Litecoin – $60 USD, as of today? In the first place, it implies that LTC currently has a very high velocity – a velocity beyond the normal range for M1 money that we assumed above. For this valuation model to yield a price of $60 USD for LTC, the current market price, LTC’s implied velocity must equal 22.512. That doesn’t necessarily imply that it’s being used more and more as cash for purchasing goods and services. At least part of this implied velocity is probably due to the volume of LTC being regularly traded on exchanges. It’s also worth noting, in passing, that this implied velocity is far higher than the US dollar’s, which presents a good opportunity for research into what a good velocity is for cryptocurrencies and whether the norms of fiat currency are a good proxy for cryptocurrencies. Second, the model implies that the market should keep an eye on the number of Litecoin transactions. If the number of transactions increase, then the model implies that the price of LTC would increase unless velocity also increased – and, given that LTC’s implied velocity is already so high, it’s unclear whether velocity could continue to increase. On the other hand, a stagnating or decreasing transaction volume, according to the model, could theoretically indicate an impending price correction. As we said at the outset, with cryptoassets being so new, the matter of how best to value them is far from settled. While there is a logic to the method we used here, it’s far from a perfect tool. There are many potential, well-founded frameworks by which one can arrive at a valuation. This valuation also does not take risk into account, and risk may warrant the application of a significant discount to the asset’s price. For example, if the fair price of LTC is theoretically $90 and it’s currently trading at $60, there’s an implied discount rate of 14.47% over three years. Part of evaluating LTC is not just asking what its fair price is, but also whether, in this example, a 14.47% discount rate over three years is a good risk/reward scenario. While Litecoin started out as a clone of Bitcoin, it’s come into its own since those early days, as a cryptocurrency on a mission to give the world frictionless, digital cash. The more it’s able to succeed in that mission, the more utility it will have, and the more appealing its fundamentals will look. With a clear leader driving the project forward, it seems as if Litecoin is well-poised to execute changes designed to further improve those fundamentals. While the crypto space is rapidly developing, we’re still in its earliest days. If you want to keep apprised of the sector’s real growth, consider focusing less on hype and more on meaningful statistics like adoption, transaction efficiency, and modulating coin supply.